It wouldn’t be Thanksgiving for me without homemade cranberry sauce or relish. It’s so simple to make and it tastes so good. 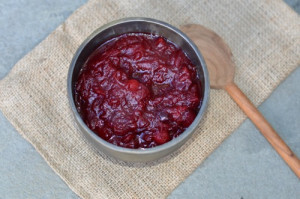 When I’m starting my cooking for the holiday I love to make the cranberry sauce first , because it takes just a few minutes and I can look at my list of dishes to prepare and within minutes – cranberry relish – check and done! From by the bay, wishing you citrus cranberry food memories! Combine cranberries, orange juice, zest,sugar and cinnamon in a medium sauce pan. Bring to a boil, stirring to dissolve sugar. Reduce heat and simmer approximately 10 minutes until the cranberries start to burst. Remove from heat and add Grand Mariner. Cool completely and then chill in refrigerator. Cranberry sauce will thicken. Serve chilled. This entry was posted in side dish and tagged citrus cranberry relish, citrus recipes, cranberry recipes, Grand Marnier, sauce, Thanksgiving recipes on November 12, 2015 by entertainingbythebay.